Happy Holidays! One of the more interesting things that's happened since the previous post is that we seem to have discovered a new, previously unlitzed pre-Shortzian puzzle! Here's how it all went down. Earlier this week, Jim Horne and I were trying to straighten out exactly how many missing puzzles there were. Jim noticed a discrepancy in our records for the August 13, 1978, puzzle—the first Sunday during one of the strikes. Barry Haldiman's records indicated that a puzzle had been published that day ("Putting on Airs," by Louis Sabin [see more on Lou below]), but I hadn't been able to find the PDF on ProQuest. I shot Barry an e-mail about this puzzle, which he apparently had added to his records after his original microfiche search of The New York Times Magazine. Barry speculated that the puzzle might have come from microfilm that carried a different version (international or West Coast) of The New York Times, though why just this one strike puzzle turned up is a mystery. Nonetheless, this discovery gives the missing puzzle quest a new ray of hope! Barry sent me pictures of the puzzle and solution from a book preview on Amazon, and I litzed it yesterday. Kristena Bergen proofread the puzzle, and then I sent it off to Jim. So expect to see a new puzzle on XWord Info in the not-too-distant future! This seems like the perfect time to publish another amazing olio of pre-Shortzian constructor research from historian, litzer, and proofreader Todd Gross! This is such a wealth of information that I've decided to divide it into two sections: The first contains several individual updates Todd sent to me, and the second features a collection of constructors he grouped together, which I've dubbed "The Sequel." Thanks so much again, Todd, for all your tireless research! In mid-November, Todd sent me these photos of three constructors, whom he thought were all still alive and living in the New York City area. Todd noted, "If I'm right, Charles Matonti turned 80 this year, Elio Desidario recently turned 89, and Jack Harnes turned a very respectable 93 a couple of days later." A few days after sending the above, Todd wrote me that while researching crossword-related obituaries, he'd come across an obituary for Betty Jane Cometa, which you can read here. 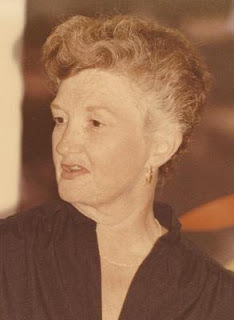 Betty Jane published 5 (or more) puzzles in the Times between 1982 and 1989. Todd's discovery was particularly important because previously we hadn't been able to determine the gender of the constructor known only to us as "Cometa." 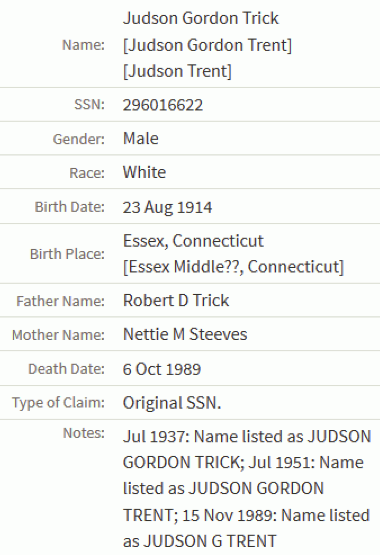 Todd reported that Betty Jane was born on September 11, 1932; according to the 1940 Census, lived in Nassau County, N.Y., when she was 7; and passed away this October at the age of 83. The next day, Todd sent me a link to a delightful article on Lou Sabin, which you can read here. 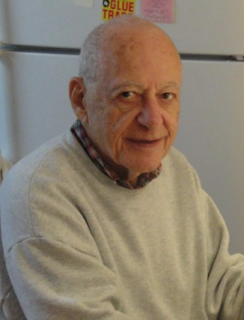 According to my records, Lou published 109 Times puzzles between 1955 and 1993 and so far has published 29 more during the Shortz era, the most recent appearing in 2009. Todd said that as far as he knew, Lou and his wife, Francene, were still alive. Finally, at the end of November, Todd mentioned that he had been compiling a list of crossword constructors' birthdays (and, where applicable, dates of constructors' deaths). His list includes pre-Shortzian and Shortz-era constructors, as well as a couple of constructors who published before the Times crossword began. The file, too big to reproduce here, also contains information on constructors' cities and states, where available. And now, here's Todd's opus! She was born Judith Carol Kuta on 25 Dec 1943 (Christmas Day!) in Amsterdam, Montgomery County, New York. I have a picture of her at Mont Pleasant HS in Schenectady, NY in 1961. 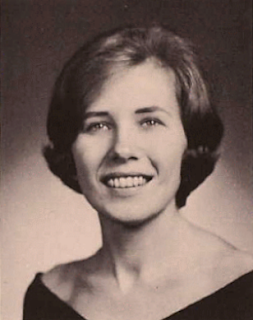 She then attended SUNY Cortland (in Cortland, NY), where she served as a co-editor of the Hilltop Press. I have a picture of her from 1965 in that role. 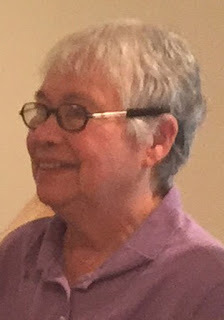 She married Thomas Dalton on 3 July 1965 in Schenectady. I was able to “screen scrape” the relevant info from Newspapers.com, which allowed me to confirm I had the correct person. Crosswords don’t enter the picture (as far as I know) until she and Thomas move to Saginaw, MI. I don’t know when they moved, but this article says Thomas was Saginaw’s City Manager from 1978–1986. It also says Judith (Judy) Dalton constructed puzzles for the New York Times (her first puzzle in XWordInfo is from 1981). And thanks to this article, I unfortunately can confirm that Ms. Dalton passed away on 8 Jan 1999 at the age of 55 in Indialantic, FL. 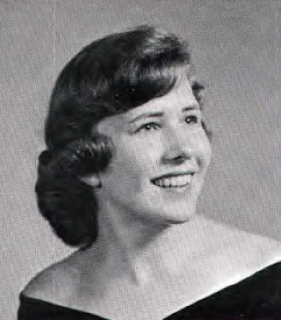 Finally, let me include a picture of just her from SUNY Cortland in 1965. You may want this to be her XWordInfo gallery picture. She was born Anna McCreery Lamouree to John E Lamouree and Mary McCreery. I don’t know where she was born, but probably somewhere near Tuxedo, NY, where she was raised, as her father’s family has deep roots in the area, as discussed in this article, which mentions Anna as a junior at Cornell. 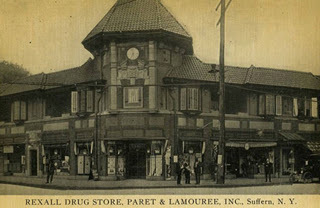 As the article mentions, John was a co-owner of the drug store firm Paret & Lamouree, which had stores in Tuxedo and in Suffern, NY. I was lucky to find an old photograph of the Suffern store. Anne/Anna (I’ve also seen Ann in some places) did attend Cornell, but alas she didn’t graduate. 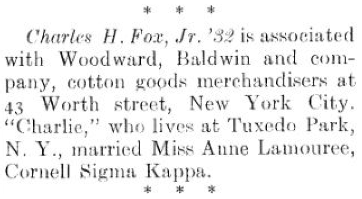 In her 3rd year she met Charles Fox and married him, and they moved in with Anne’s family in Tuxedo (according to the 1940 Census). So no class picture of her as with Judith Dalton. 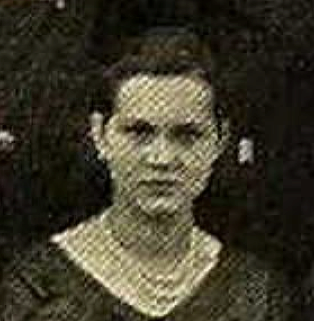 However, I did find a picture from her junior year (1931) of the sorority she belonged to (Sigma Kappa). Here is the picture. I’ll tell you which one is Anne in a bit, first I want to mention other tidbits I found about Ms. Fox. First, an obit notice in the Apr 1984 Cornell Alumni News that makes the connection to crosswords clear. Finally, an article from the Feb 1937 issue of The Alpha Delt, produced by the fraternity Charles Fox belonged to (Alpha Delta). It shows that Charles wasn’t just freeloading off his new wife’s family. As ETM noted, at the time Charles Fox “recently retired from a position as sales executive in the textile business.” So Charles was certainly successful in his own right. OK, now let me tell you which of those sorority women is Anne Fox. She’s in the second row from the top, 3rd from the right, wearing a pearl necklace. Here’s a grainy enlargement I made of Anne. 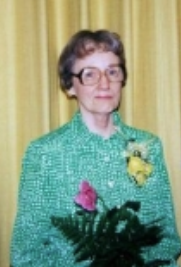 Judith Perry was born in Barre, VT on 8 Apr 1920, she graduated from the University of Vermont with a music degree in 1943, never married, taught and played piano and organ, created crossword puzzles, and passed away in Northfield, VT on 3 Mar 2011 at the age of 90. As far as I can tell, she lived in Vermont her entire life. I don’t know when the picture in her obituary was taken, I’m guessing well before she turned 90. I only have one more thing to add. 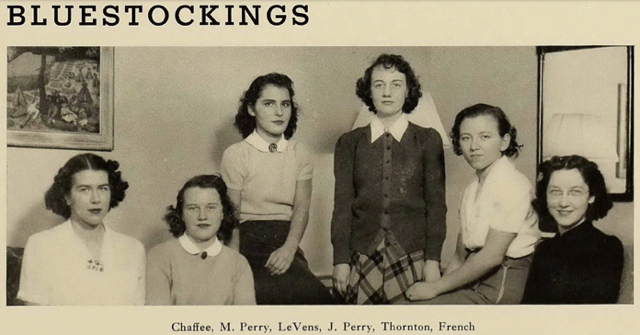 There are several pictures of her from the U of VT. I’m enclosing the one that looks best (in part because she’s in the smallest group): the Bluestockings Club of 1943. I note bluestocking is defined as an intellectual or literary woman, though it’s not meant as a compliment. I’m glad to see the label taken as a badge of honor, like other pejoratives (e.g. queer). 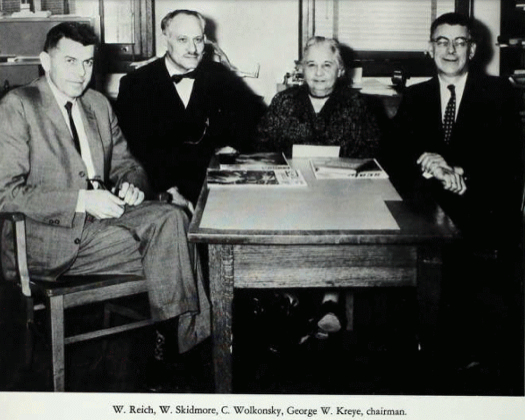 In fact, Warren W. Reich (sorry, don’t know what the middle W stands for) served as a professor in the Slavic and Germanic Languages department at SUNY Albany. This picture from 1964 (when the dept. was founded) shows Mr. Reich, professor of German, on the far left. 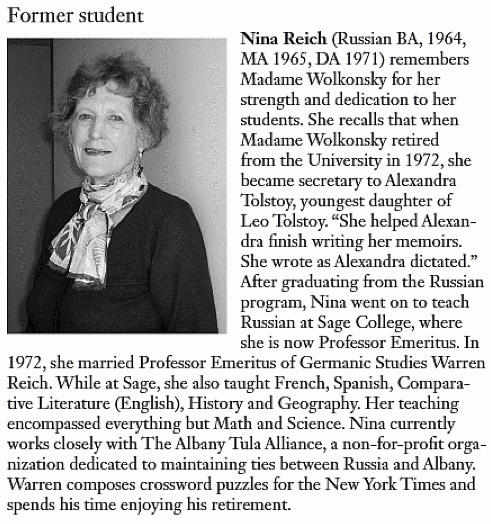 I know this Warren Reich is our constructor because of an article about his wife Nina, who studied with another faculty member in the above photo (Madame Catherine Wolkonsky). Most of the article, taken from the Spring/Summer 2009 edition of the SUNY Albany LLC News . . . is about Nina, but the last sentence mentions Warren and crosswords. Image courtesy of the LLC News. I can tell you a bit more about Mr. Reich. He was born 26 Jun 1923, probably in or near Erie County, NY. The 1940 Census shows him living in Tonawonda, and in 1943 he enlisted in the Army from Buffalo. His occupation at the time was cabinet maker, so I’m guessing he got his education after WW II. And I’m reasonably sure Mr. Reich is still alive. Besides not finding an obituary, and having what appears to be a current address for him, I have this article from 2011 about a student reconnecting with him…a student from when he taught German at Mont Pleasant HS in Schenectady (sound familiar?). If Mr. (Dr.?) Reich is fine with reconnecting with an old high school pupil, I’m hoping he won’t mind an interview with a fellow NYT constructor he’s never met before. Let’s start at the end, with an obituary in the Washington Post. . . .
and in Boston in 1964 (working as a composer apparently for the Boston Globe). One could ask how Mr. Trent could have been working full time in Washington since 1962 and be working in Boston in 1964, but we’re going to overlook that for now. The tale gets a lot more interesting when we look at this Social Security claim for Mr. Trent. 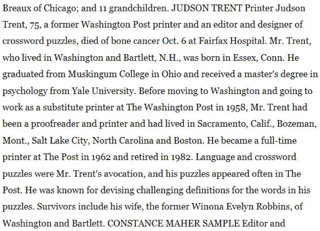 Note the birth date and place match our obituary, so Mr. Trent was born Judson Gordon Trick, and changed his name to Trent in the early 1950’s, when he was 36 or so. This name pops up in a few places. First of all, I couldn’t find a connection to Muskingum College as mentioned in the obituary. 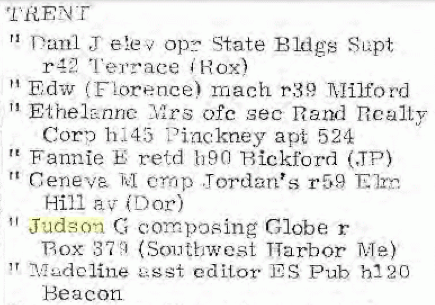 But I did find a Judson Gordon Trick attending Oberlin College (in Oberlin, OH) in 1937. 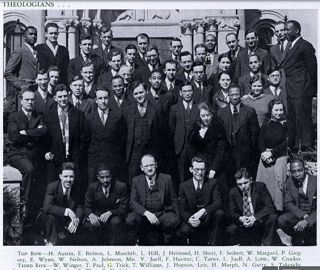 There’s a picture of him (the only picture I have) with a group called Theologians in this annual volume. Mr. Trick is in the “third row,” wherever that is exactly. So no, I can’t tell you which of these people is Judson Trick-or-Trent. 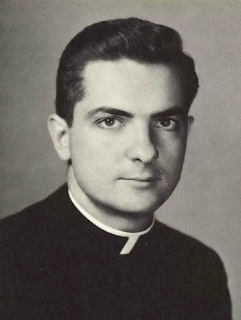 I also didn’t find this name connected to Yale University…but I did find a Reverend by that name living in New Haven in 1942. Well, being a Reverend makes sense connected with the Theologians group at Oberlin…but the obituary mentions psychology, not theology. And what does all this have to do with proofreading/printing, which is what he was doing when he started constructing (lots of) crosswords? Could these be two different people? Maybe…or maybe not. All I can say is, I have several unanswered questions, and I wish I was as good at solving tricky puzzles as your average ACPT attendee. Fortunately, I have other sources to tell me more. He was born Thomas Westlake Underhill on 6 Apr 1924. [Ed. : Thomas W. Underhill published 11 (or more) pre-Shortzian Times puzzles between 1986 and 1993, plus 1 during the Shortz era.] 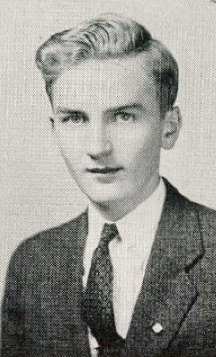 I’m not sure where he was born, but probably in or near northern New Jersey, as I have a picture of him from 1941 at Summit HS in Summit, NJ. 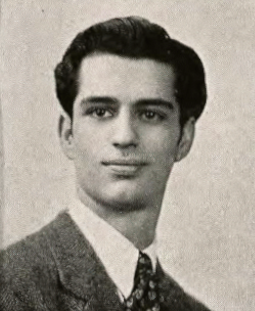 I also have a picture of him from 1944 at the College of New Jersey in Ewing, NJ. Mr. Underhill is the second from the right. This picture is the school’s Charter Club…actually, the group was large enough to need two pictures. I was lucky Thomas sat in the front, so I could include the legend without making everything too small. He went on to get a bachelor’s degree from Princeton, then a degree from Harvard Law School (hence the obit above). But we haven’t mentioned crosswords yet. We also haven’t mentioned that Thomas was a mystery writer. 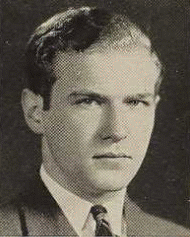 He wrote a novel called The Cambridge Caper, which was published posthumously by his children. 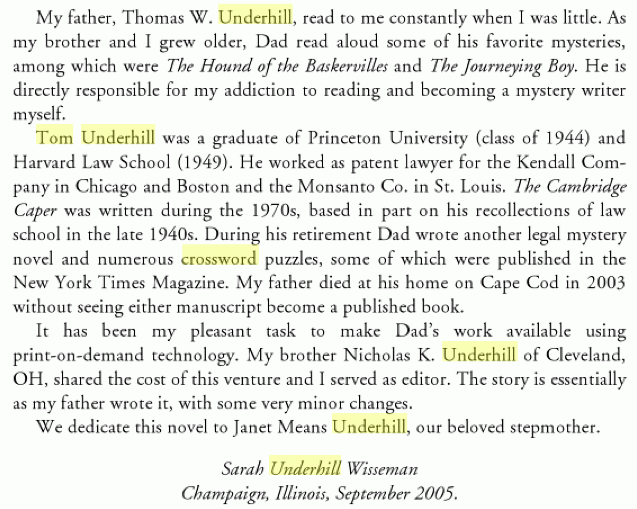 Here is the introduction written by his daughter Sarah, which gives a nice overview of her father, including mentioning he constructed crosswords. 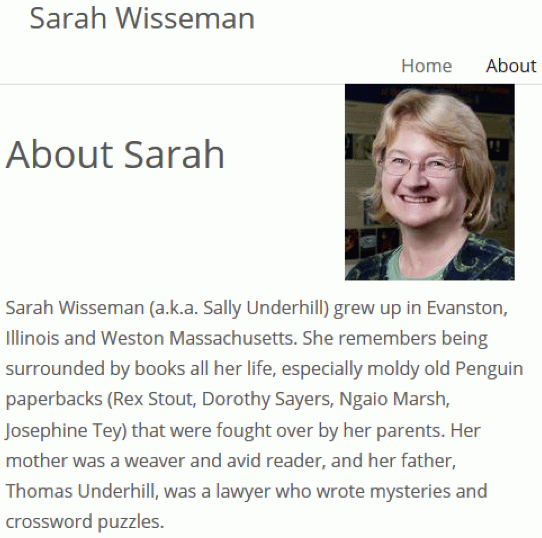 Sarah Wisseman isn’t just a mystery writer, she’s also an archaeologist who published “five books of non-fiction on ancient Greek vases, Greek archaeology, scientific methods in archaeology, and Egyptian mummies.” This is from the About page on her personal website . . . , which I enclose a part of below. Her website also has a Contact page, where one can e-mail Sarah. . . . 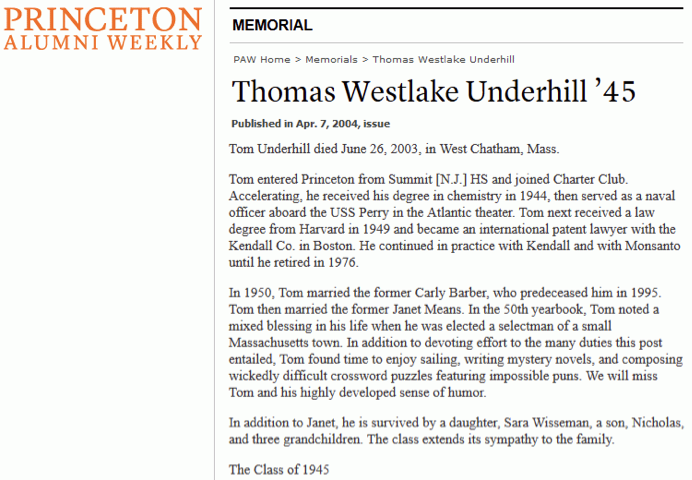 Finally, I want to mention another obituary I found, this one from Princeton University. As you can see, they published a more thorough biography, including details I wasn’t aware of. Score: Princeton 1, Harvard 0.